Every once and awhile a cooking video appears in my Facebook feed that cannot be ignored. It makes my mouth water. Then, if the timing is right it goes instantly to the top of my must make list. Such is the case with this recipe - Grilled Huli Huli Chicken from The Recipe Critic. They in turn adapted it from a recipe on Taste of Home. You know it must be good when it continues to move from one site to the next. I have company coming to stay in just a few days, so have been trying to make a meal plan for the time she is here. I don't have to spend time thinking about what's on the menu. AND we have just headed into the first of our sunny, warm spells, so grilling fits right into the mix. Since I won't be making this for 3 or 4 days, I can't comment on how it turned out. So be sure and check back for my notes. But I can tell you right away that the combination of pineapple juice and brown sugar in the marinade/baste bode well. Citrus is great for adding flavour and tenderness. Brown sugar will add a wonderful caramelizing note in both the flavour and colour. I truly can't wait to try this for her and am pretty sure it will go into regular rotation in my meal planning. Not sure yet if I'll be grilling the fresh pineapple on the side, but who knows. And as a sided bonus - cooking the meat on the grill means there are less pots and pans in the kitchen to clean up which means more time having fun with my friend. 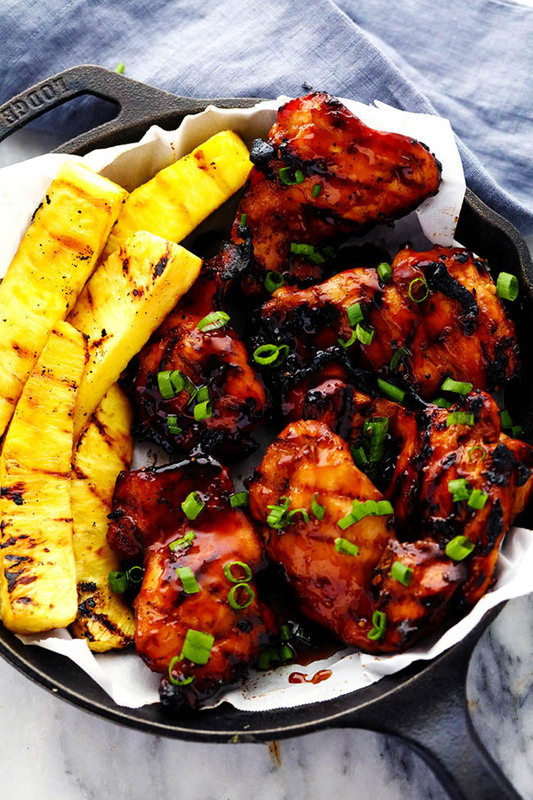 In a medium sized bowl, whisk together pineapple juice, soy sauce, brown sugar, ketchup, chicken broth, ginger and garlic. Reserve 1 cup sauce for basting. Add the chicken and the rest of the sauce to a Ziploc bag and marinate at least 3 hours or overnight. Grill the chicken, covered, over medium heat for 6-8 minutes on each side or until no longer pink. Baste occasionally with reserved marinade during the last 5 minutes. Garnish with green onions if desired. Note - this recipe is on many blogs. Couldn't find the video from The Recipe Critic on Youtube, so snagged this one from channel called Bread Booze Bacon.